This is a guest post by Adam, who is a website content copywriter, and an Internet marketing expert. Find out more on this website. Talk to any web business owner, and you will hear the horror stories concerning information overload. Unfortunately we seem to be unable to wrap our hands around all the news and information each business day. Even though so much information is important, we still have our marketing and daily business to attend to in a timely manner. Just getting to the point where you have your system in place for it all can be daunting. Lots of businesses have a tough time with this issue, and that is why we want to share some proven methods for coping with too much information in business. We know that in the beginning it all can look overwhelming, but it is not and action is the order of the day. 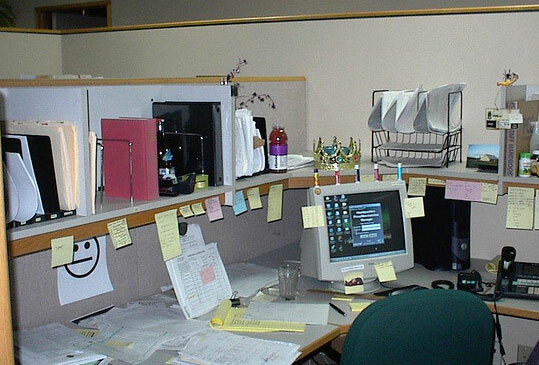 Does your desk or workplace look like this? Before we start-off with the strategies to tackle information overload, take a look at how clutter affects your concentration and realize the importance of a hassle-free environment. Remember that forming new and positive behaviors does not happen overnight, but you simply must do this if you want your business to improve. But we also realize that a certain amount of information intake is necessary simply due to the nature of business on the web. It is a simple matter of making a business decision and then putting known principles into action as soon as possible. Have patience with the process because you are adopting a new behavior which does require some time. There will be some things that just have to be done in a certain order, so accept it and do what needs to be done. You don’t have to read everything and consume all the information right now. You know your own situation, so you can arrange some kind of schedule for reading lower priority items. Also remember that we are not talking about theory here; this is real world tactics that have been proven to be effective. Take a break every now and then, and in fact it is highly recommended by professionals that you do that. Letting your brain rest is a smart idea, and when you are doing that it is processing the information. Also, your brain will become more efficient, and so you can manage information more efficiently with this very same approach. When we say take time out, we do not mean weeks and months – a few minutes can do in a pinch. There is nothing like refreshing your mind in the middle of the day, and it will make a difference in how you feel. You will find that applying sound management approaches to information overload will produce a desirable response. Remember our advice for becoming much more selective about who you listen to in terms of informational input. Have confidence that you have the ability to become much more efficient and can tame the information overload beast. Adam is an Internet Marketer for 7 years now. He advices his clients and in turn helps them to get huge traffic to their sites. I have found that if my office is in order and neat then I am in order, the second my office becomes a mess I get more and more scattered.